Black and white negative showing the Whitby Red Wings Junior A lacrosse team. They are dressed in uniform and holding lacrosse sticks. The photograph was taken in the Whitby Community Arena. The Whitby Red Wings were sponsored by Norman Irwin of Red Wing Orchards. 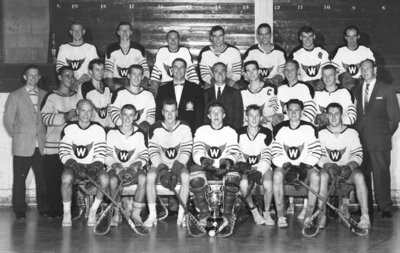 They were the Ontario and Eastern Canada Junior A Lacrosse champions in 1960. They were Minto Cup finalists at New Westminster, B.C. Printed on mat board underneath the photograph: Back row: Pete Berge, Ray Lock, Terry Davis, Wally Thorne, Jim Vilneff, Glenn Lotton, Brian Gibson. Middle row: Herb Tran (publicity), Denton Rendell, Barry Campbell, Paul Tran, Ivan Davie (manager), Ben Groves (coach), Charlie Grandy, Phil Hall, Bob Carnegie, Jack Town (trainer). Front row: Elgin Luke, Ken Curran, John Roberts, Bob McCready, Elmer Tran, Ken Ross, Bill Biggs. Whitby Red Wings, 1960, unknown photographer, Whitby Archives, 21-016-001.